It appears from trials conducted that it is economically viable to give additional supplementary feed when conditions are poor (drought/winter). However when adequate nutrition is provided (Lucerne hay) additional feed does not appear to be of significant benefit to mohair production under intensive conditions. The investigation was carried out at the Grootfontein College of Agriculture over a period of six months. Forty 12-month-old Angora kids were divided into two groups in such a way that each group contained equal numbers of ewe and kapater kids. The kids were shorn just prior to the beginning of the experiment. In this study Angora kids were divided into two groups..
LOW level of Nutrition had 70% lucerne + 30% milled wheat straw. With the exception of style and evenness of fleece, nutrition appears to have a substantial effect on all the important quantitative and qualitative characteristics of mohair production. Mohair production by ewes fed an ad lib lucerne diet compared to those receiving additional chocolate maize. Each group (4 groups) was kept in a separate pen for the duration of the experimental period. Lucerne hay was given on an ad lib basis. The ewes were shorn at six and 12 months after the onset of the experimental period, while the kids were shorn at six months of age. The following mohair parameters were recorded for each goat. The rate of supplementation had no significant effect on any of the mohair traits measured. 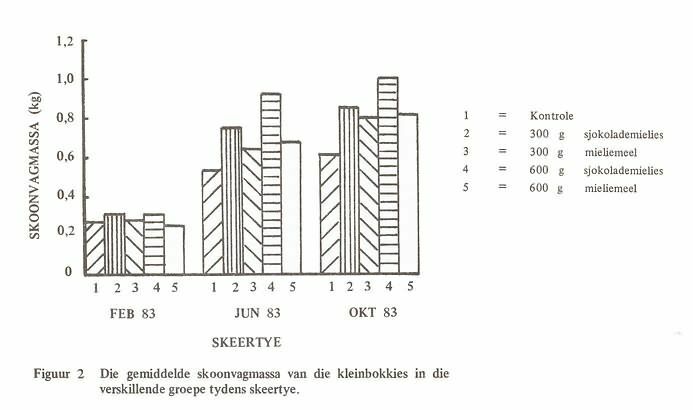 If we however consider Angora goats under veld conditions it is important to remember Loubser (1983) recorded an increase of 3,8 kg in body mass of Angora ewes grazing mixed karoo veld supplemented with 400 g chocolate maize/ewe/day, compared to a control group receiving no supplementation. Under veld conditions it is often physically impossible for the ewe to take in sufficient roughage to meet her nutritional requirements during the last third of gestation and during lactation (Van der Westhuysen et al. 1988). From this trial it seems that the lucerne fed in this experiment supplied sufficient nutrients to the ewes during periods of higher demand. 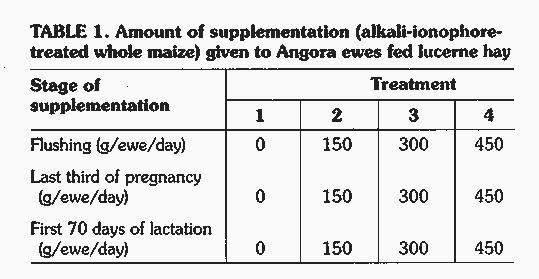 Kids were fed from weaning to 13 months on the following supplementary rations while on the veld. The both chocolate maize group produced more mohair. The 600g produced the most hari.